The ongoing story of Mary and her friends comes to an end with this final chapter of the À Moi Paris series. This audiobook will also briefly explain the constructions and details of indirect / reported speech, but mostly teaches by example throughout the story. You’ll learn all kinds of fun idioms and upscale vocabulary and then the Q&A section will then help you test your understanding and practice speaking out-loud. 10 Hours 8 min of story chapters + study guide + mini-lessons + Questions & Answers – all professionally recorded by a Parisian native + 249 pages transcript. Review of – À Moi Paris 8 – Five stars. I am currently working my way through À Moi Paris 8 and thoroughly enjoying the experience. Camille has again managed to include a huge amount of very useful day-to-day vocabulary in the context of an entertaining story. The main grammatical focus in this volume is indirect speech, but along the way we learn how to talk about web site development, recipes, wine tasting, healthy eating, movies, business meetings, Yoga, and so much more. The combination of printed text, in both French and English, the audio dialogue, at two speeds, and Camille’s very clear and easy to understand explanations of difficult grammatical points makes this entire series of eight volumes the perfect learning tool for any student of French. Camille’s approach to teaching is a refreshing change from older, outdated methods and is tailor made for the student who wants to end up being able to speak real, everyday French with ease. 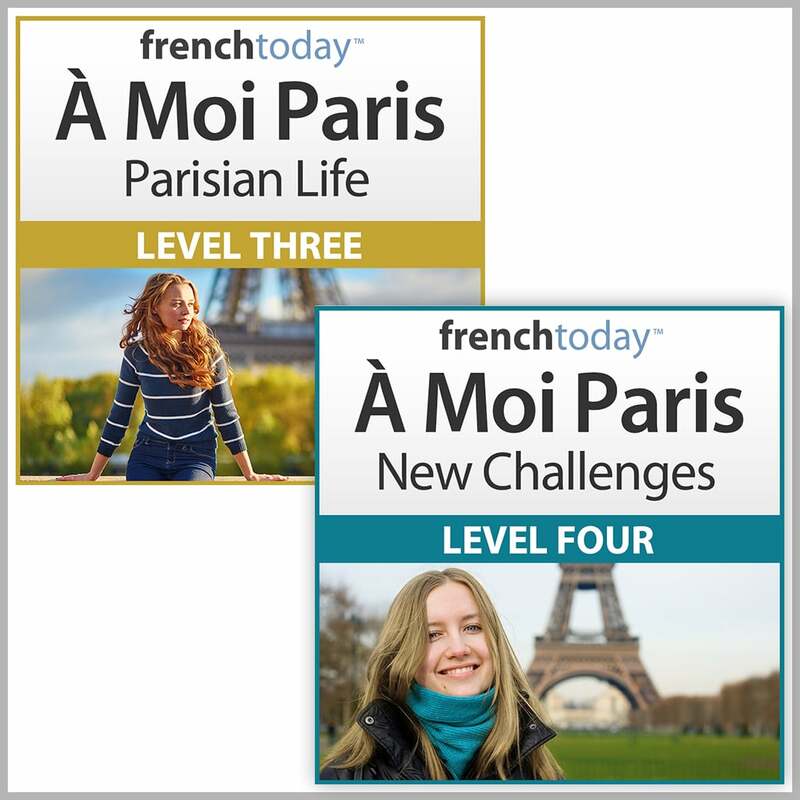 I recommend the entire À Moi Paris series wholeheartedly; it is by far the best learning tool that I have ever found to improve my understanding and fluency in the French language. 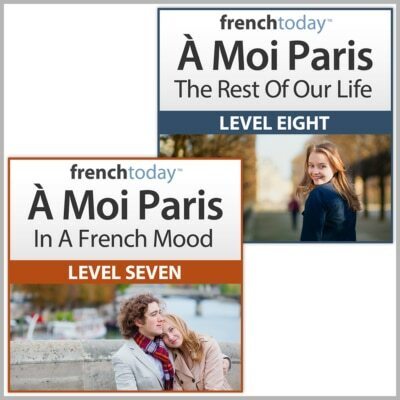 I bought my first audiobook, À Moi Paris Level 2: Meet the Gang (which was originally the first novel and under a slightly different name), from French Today a little over 5 years ago and since then have been in sheer awe at how beautifully and wonderfully this series has evolved. 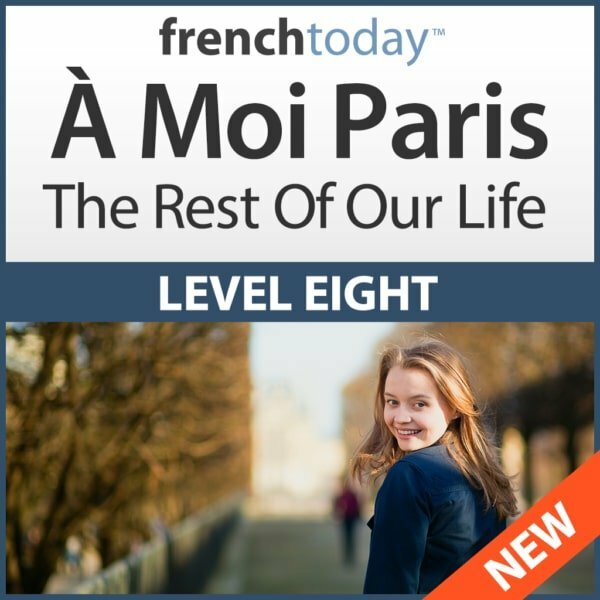 At the time there were only 2 À Moi Paris novels – now there are 8 + the little prelude one, which all perfectly cover the needs of every French student from beginner to advanced. I bought each new addition as it came out and now own the complete series. And you know what? I don’t regret a single purchase! They were all money well spent. The amount of content and work put into these novels is unparalleled compared to some of the other products I’ve purchased to learn French. 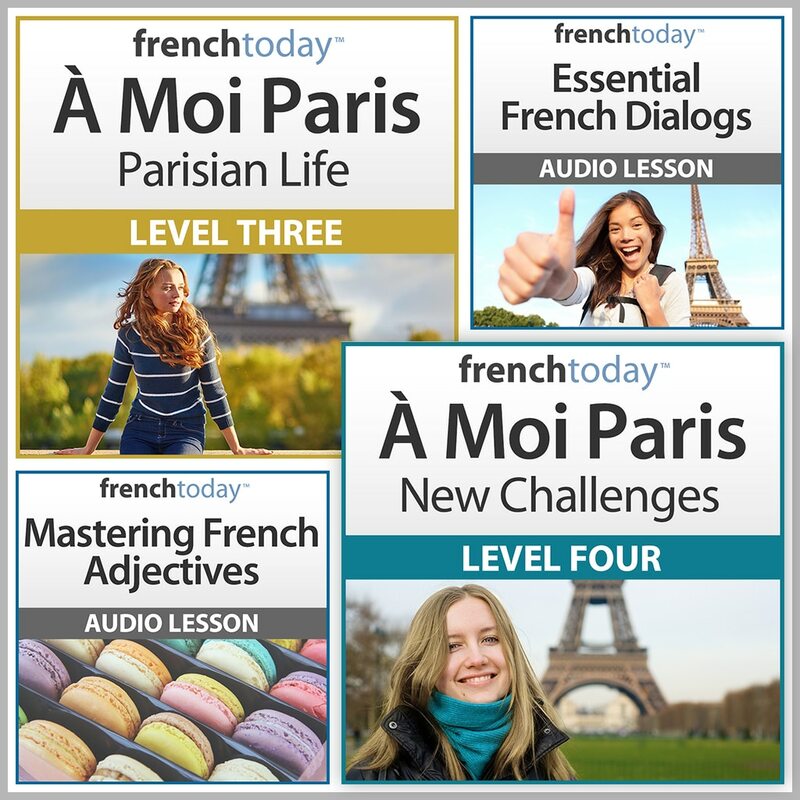 These audiobooks are filled with lively stories and characters that enthrall you and actually make you want to continue to learn French just to see what happens next, helpful study guides to learn grammar in an entertaining way and what seems to be an endless amount of useful expressions and words to really make your French pop and sound much more natural. Camille’s clear, melodic voice and the dialogs at different speeds are perfect for training the ears! What I also like is the clever way she used the novels to build off of one each other: the odd-numbered audiobooks (1, 3, 5 and 7) are used for learning new grammar concepts and then those concepts are put into real-life contexts for better understanding in the even-numbered audiobooks (2, 4, 6 and 8). Question and answer sections are also in the even-numbered ones to further train your listening comprehension and help you strengthen your skills to understand and answer questions. À Moi Paris Level 8 is nothing short of brilliant! The final novel continues the captivating story of Mary’s life and we see how it all ends. I’m getting teary eyed since it’s the last installment, but as they say, “Good things must come to an end.” Story aside, this novel continues to help you train on the advanced concepts learned in the previous installment, as well as concepts learned in the beginner and intermediate novels. That’s why I love this series so much, every audiobook builds off of one other, unlike most French textbooks where you go through a beginner one and then struggle to find an intermediate one that builds off of that one. Finding a suitable advanced book is even more difficult to find since they all have their own type of assumptions on what you should know already. 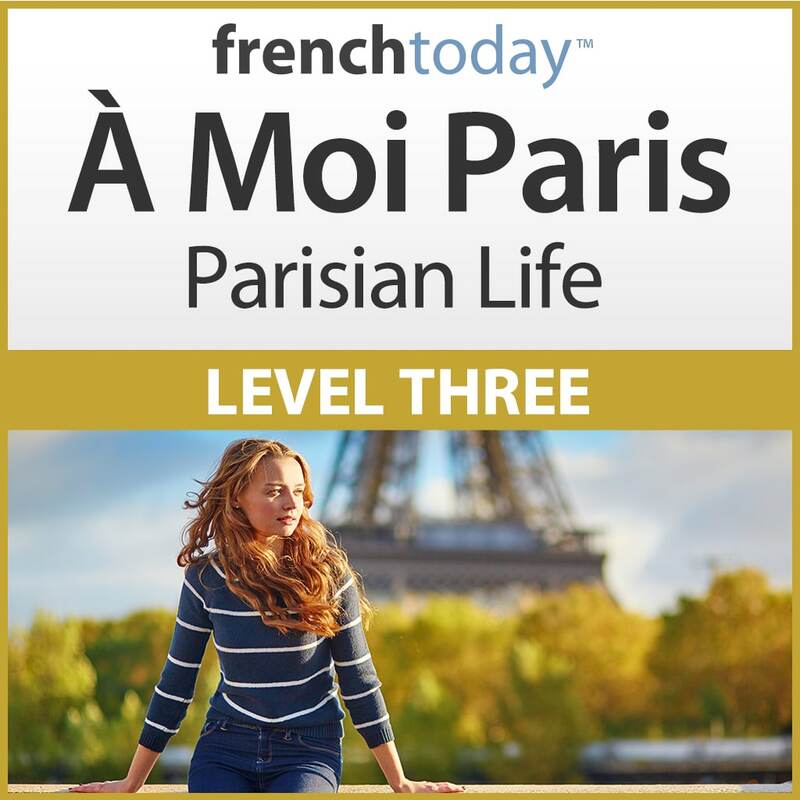 Back to À Moi Paris, the audio is excellent, the story is once again thrilling, the study guide lessons are helpful as usual and there are even more advanced topics to further develop your French fluency. I already love this one as I have with every À Moi Paris novel. French Today’s method has without a doubt made learning French a thousand times more fun and, most importantly, possible! Thanks for the AMP 8! I’ve been waiting for this and was not disappointed! What a book to end the series! As always it was excellent to listen to – I had tears in my eyes after the last chapter. Following the lives of the characters from their late teens to adulthood, and then parenthood, affords an opportunity to understand the context of the stories and to assist with visualisation. With this, as the other books, I tend to listen while commuting and Camille’s diction and presentation is excellent – allowing the listener to understand the way glidings and liaisons work in current spoken French. The coverage you’ve managed to squeeze into this book is a credit to you. Not just indirect speech – everything from building web-sites to cooking, wine appreciation, diet, romance, yoga, dealing with family problems and more. All this set in a new context, and exposition of Patrick’s work. All this helps even more to arm your students with vocabulary, phrases and imagery that can be used in normal life and conversations with native speakers. The body of work that you have undertaken for this and your previous books is very impressive and a credit to your insight into a different way to impart fluency in “La belle langue”. I thank you again and again for your method – I love your books – what an inspiration! I thoroughly recommend to students of French not just this series, but your other audio books “Une semaine…” as well as your more directly grammar tutorial works. My facility with French has grown with every book over the last few years! So Camille and Olivier – what’s your new project? I’m waiting! !